It appears that the tech media (the U.S. based outlets, at least) are finally learning that F1 is the most technological of sports. The first (of many, hopefully) U.S. Grand Prix in Austin, TX was well-run and great fun to watch. The organizers also knew how to attract media and invited tech and business journalists to witness the spectacle. What they found amazed most of them. We Americans are used to sport as spectacle, but that spectacle is mostly found in advertising, huge audiences and Hulk-sized athletes. This time the spectacle was found in the way the cars launch like rockets, change direction like hummingbirds and stop on a dime. Oh, and the massive amounts of tech that make it all work. F1 is the NASA of sport. Each race is a moonshot, a shuttle launch, or a 7 Minutes of Terror landing. It requires dozens of engineers, massive amounts of data and computing power, and practice, practice, practice. Every self-respecting geek should join the speed freaks in watching F1. Each race is as much a celebration of engineering, aerodynamics and physics as it is of sport. The cars themselves are modern marvels with 130 sensors sending data back around the world in real-time. The drivers withstand up to 5Gs of lateral force as the circuits change direction or compress them into the car. The engines operate at 18k RPM without breaking down (usually) and use hybrid energy recovery systems to boost power. Wins are measured in hundredths of a second. There are so many reasons for geeks to enjoy F1, but Wired’s GeekDad focused on 10 of them recently. The 2012 season ends this weekend (and what a season!) but you have until March to learn about the sport, watch this year’s races and prepare for 2013. I completely agree with this. Journatic’s problem is with execution, not concept. The core concept, however sad, is sound. It’s just not reasonable to pay reporters to simply gather data (school lunches, police blotter). I used to hope this sort of content could be fully automated (see: EveryBlock) but, as with the evolution of search from hand-built directories (Yahoo!) to algorithmic search (Google) to algorithm+human-powered social search (Bing, Google+), we learn that the algorithm needs help. The sources (local governments, usually) often can’t provide automated access to the data. Much of it remains – and will remain – human-powered for the foreseeable future. (Case in point: the company I work for deals with dozens of police and sheriff’s departments, each of which has their own format and process for providing blotter information and most of them are done by hand) Journalism has to evolve to become more efficient. 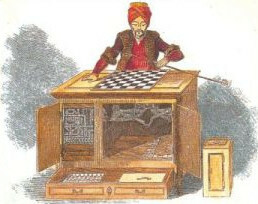 The Mechanical Turk-ization of data-as-content is inevitable. My 12-year-old Sony WEGA flat tube TV finally died in January, 5 1/2 years after Robert Scoble told me to ditch it and go HD. The new TV is glorious and I love it far more than I should, but what’s making me write about it today is the start of the 2012 Formula 1 season. When Scoble and I discussed HD in his living room back in 2006 I told him I didn’t need HD until F1 started broadcasting in HD. That started last year and now I’m able to experience the full force of HD racing. I’m stunned. It’s absolutely gorgeous and I can’t go back to watching on a laptop screen or an SD set. I’ve seen football, baseball, soccer and NASCAR in HD and none of it did much for me. F1, however, when I can see the tire tread in detail, the detail in the grassy runoff areas and the in the rooster tail spray, it’s just unbeatable. By Sony standards, the 12 year life of my WEGA was short. I really should have gotten at least 20 years out of it but I’m so glad it’s gone. My Panasonic ST30 is miles better in every way. Even better, my 2006 cost analysis was far different from the 2012 reality. The screen was most certainly not $4,000 and I didn’t need all of the upgrades I originally anticipated. Cutting off cable TV 2 years ago made a huge difference, since we already had an HD Roku and didn’t need an HD TiVO or cable box and the XBox was long gone. In the end, we grabbed the new TV, a sound bar, some cheap cables from Monoprice and a blu-ray player. All in, the cost was a fraction of my 2006 estimate. 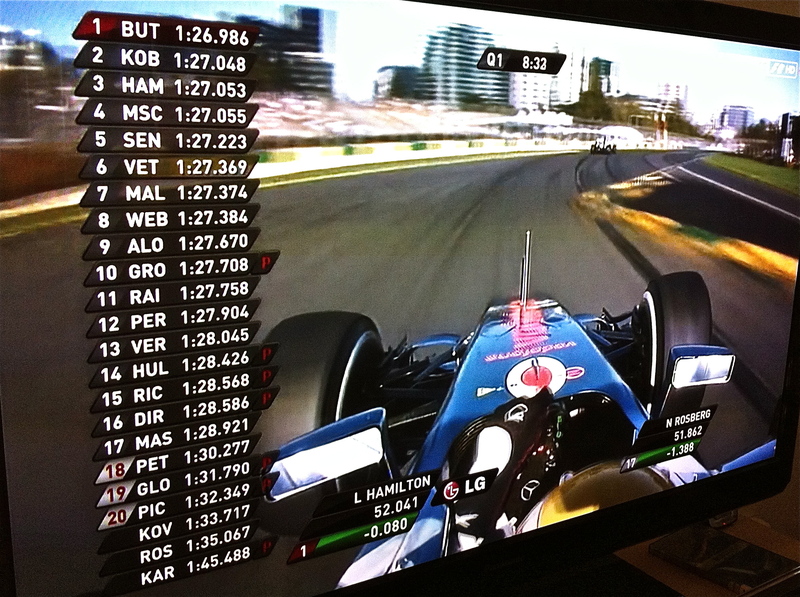 And this weekend’s F1 season opener in Melbourne is making it all worth it. You were right, Robert. Thanks. OS X 10.8 Mountain Lion: So soon, Apple? Didn’t see that coming so quickly. There’s no talk of under-the-hood changes, just new apps. I wonder if it’s really worth a full point upgrade? Looks like it’s up for a lot of criticism about the “iOS-ification” of the Mac and the fact that Reminders and Notes are pretty lightweight tools. The Messages app looks like a no-brainer (I wondered why this wasn’t in Lion) but the UI is pretty damned bad. Who wants a message app that takes up that much space? Apple is really going to ramp up the conspiracy theories with this new Gatekeeper thing. I like that sw updates are now through the App Store (though I’m sure IT won’t like that), it makes sense to combine the two update methods. AirPlay mirroring will be nice and I get the sense that the other shoe waiting to drop is a new AppleTV box or screen. Share panel and integrated Twitter? Nice, but not necessary. Safari with a combined location/search bar? Yes, please. The first Mac I ever saw was at my aunt and uncle’s house. It was a Mac 128 and my uncle showed me how to make art with MacPaint. I was hooked. The first computer I ever bought with my own hard-earned cash was the original iMac. I pre-ordered it and was at the launch party on the first day at the Mac Store near Lloyd Center. They called our names during the party to come get our iMacs. I was #5. As computers went, that first iMac wasn’t much to write home about. It was neither fast nor technologically interesting. But it was a triumph of design and focus. It worked in ways that no other computer even dreamed of. There was nothing else like it and I was thrilled to make things with it. I’ve owned and used a lot of Apple gear since then, each so much better than the ones before it, each giving me the tools to make better and more interesting things. Steve and his team have been delighting and inspiring me for years. He was one of my few heroes.